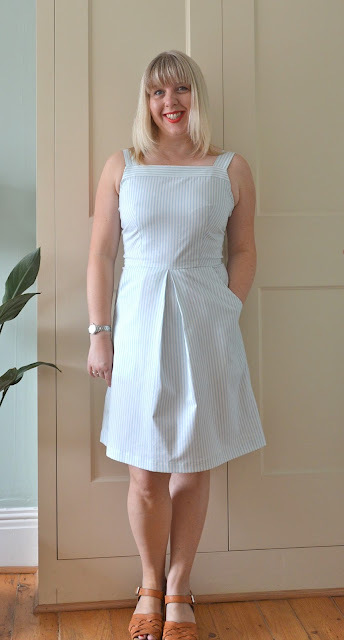 Ever since ruining my Simplicity sundress in the wash last year (the blue from the main fabric ran into the white band and turned it grey, doh), a strappy sundress-shaped vacancy has remained open in my wardrobe. So when I spotted New Look 6446* on Instagram recently I snapped it up. 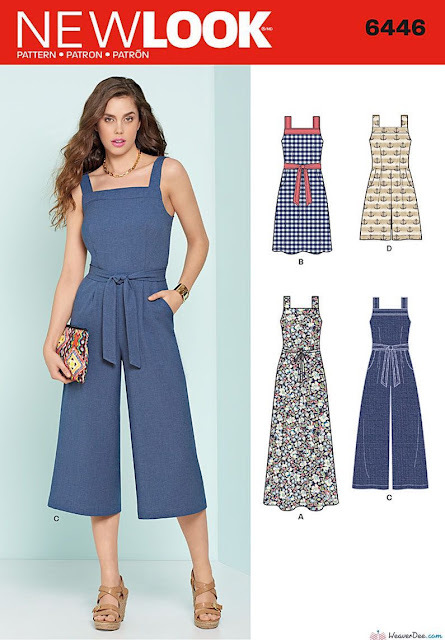 The main focus of the pattern is undoubtedly the jumpsuit/culottes and I've seen some fabulously inspiring versions (here and here). It's quite a bold look to pull off though, so I thought I'd test the water with the dress option (B) first. The bodice has a nice shape to it with a high square neckline and wide straps - a little like the BHL Flora in fact. I also like the slanted front pockets. Suggested fabrics are chambray, linen, chino or lightweight denim - anything with a bit of structure that isn't too drapey. I used a quilting cotton in ticking stripes from my stash, which fitted the bill perfectly. To line the bodice I used my favourite silk cotton. 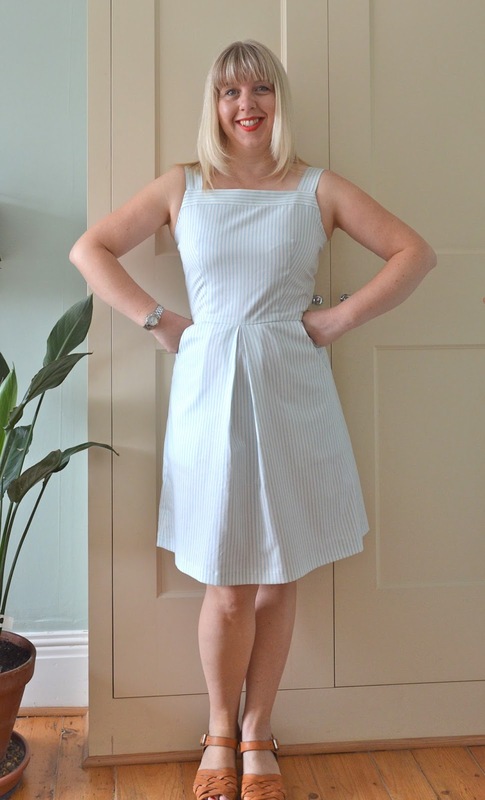 The dress came together easily and the pattern was an absolute delight to sew. I liked the combined pocket/facing piece and the instructions to attach the lining to the invisible zip by machine, both designed to make life easier! The straps are left deliberately long at the back so you can adjust them to fit. It took me a bit of pinning to get them at just the right height but they now sit perfectly and are wide enough to cover bra straps. I took a scant ¾" off the bottom hem but otherwise sewed it straight out of the envelope. 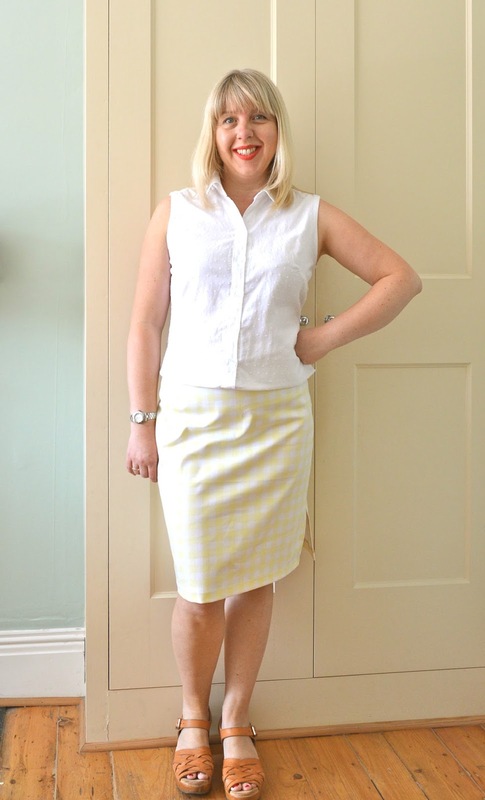 Based on previous experience of New Look patterns I went down a size from my measurements and cut a size 12. The fit isn't too bad at all - the bodice is a reasonably tight fit, but I think a looser fit would look a bit frumpy on me. 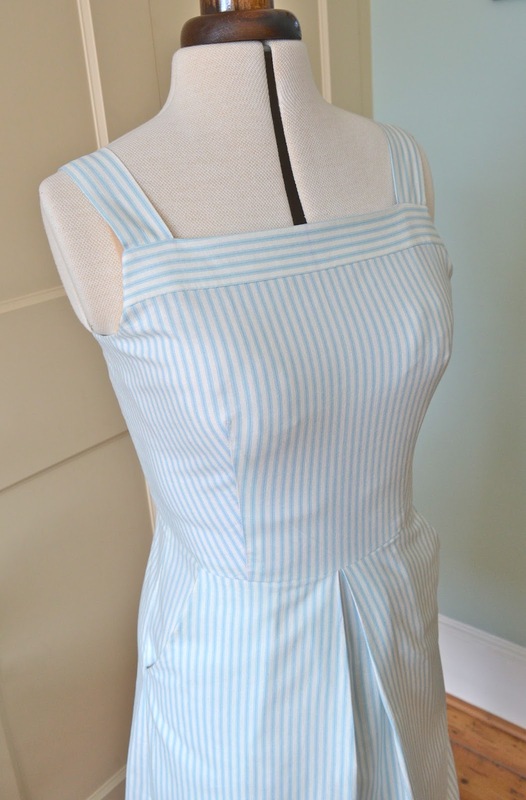 The only slight problem with the dress is that the combination of striped fabric and front bib can look a bit apron-like from certain angles! Otherwise it's light and breezy for summer and will be perfect for wearing on holiday. Adding a belt helps alleviate the apron effect! * If you like the look of New Look 6446, Weaver Dee are offering a 10% discount. Just use code JANE10, yay! 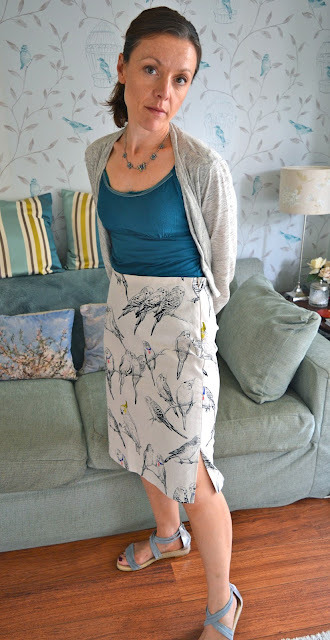 A week or two ago I promised you a budgie skirt on the blog, and today's the day! Isn't it lovely?! 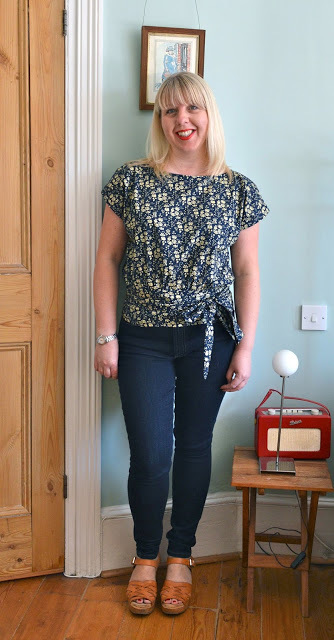 I helped my friend Emma make it using the-pattern-that-can-do-no-wrong (New Look 6217) and I think the statement fabric works perfectly with this simple pattern. The fabric is from Ditto Fabrics and is a Japanese cotton/linen blend (80% cotton, 20% linen). It's a lovely combination as it has the texture and feel of linen, but the high cotton content means you don't get lots of tiresome creasing. 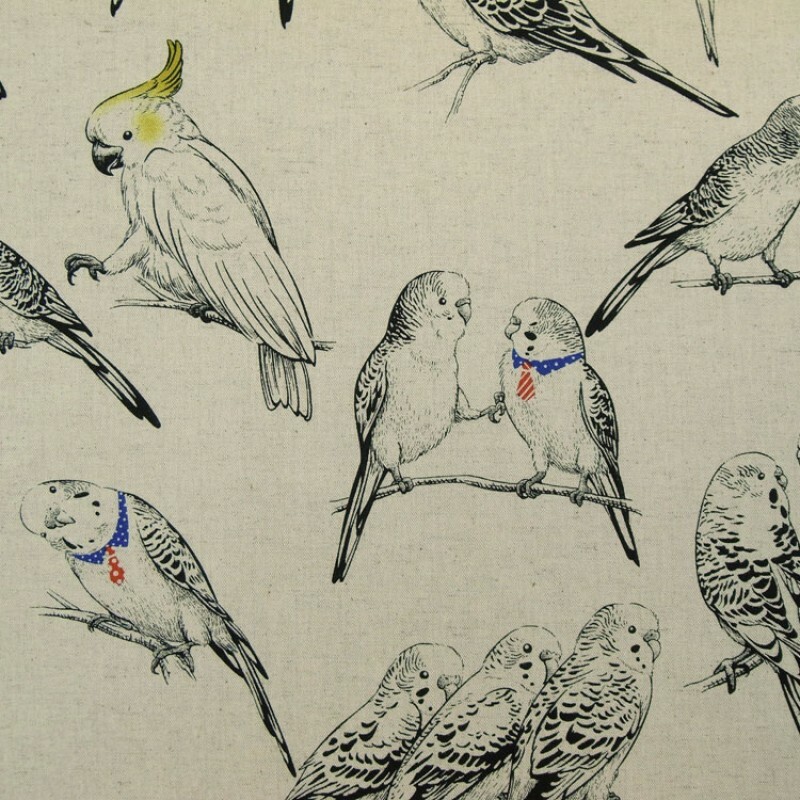 We spent a little while thinking about pattern placement as Emma wanted a couple of her favourite budgies to feature prominently. If you look closely, you'll see some of them are wearing collar and ties! 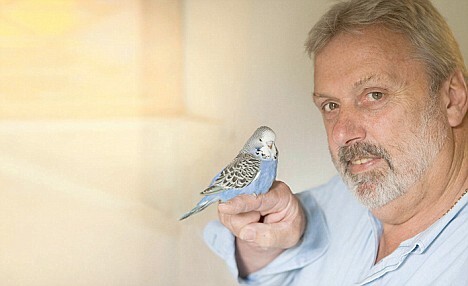 There's even a cockatoo thrown in for good measure. Size-wise we cut a size 12 with a couple of minor adjustments - increased the width of the back darts to allow for Emma's slight sway back, shaved a tiny bit off the hips and lengthened the skirt by 1½". Emma cut out the fabric and sewed the basic shell of the skirt together and I stepped in to add the invisible zip and twill tape to the waist - a splendid joint effort! 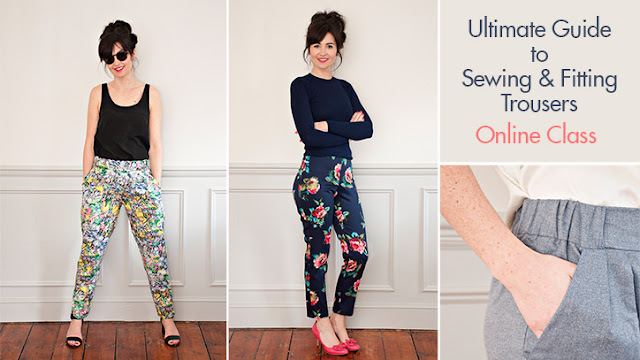 The Ultimate Guide to Sewing and Fitting Trousers is the latest class from Sew Over It and the first online course I've been tempted to buy. At £45 (or £35 in my case as there was an introductory £10 off) it's pretty good value for money - you have access to all the online tutorials plus two downloadable patterns: the Ultimate Trousers and the new Carrie Trousers. 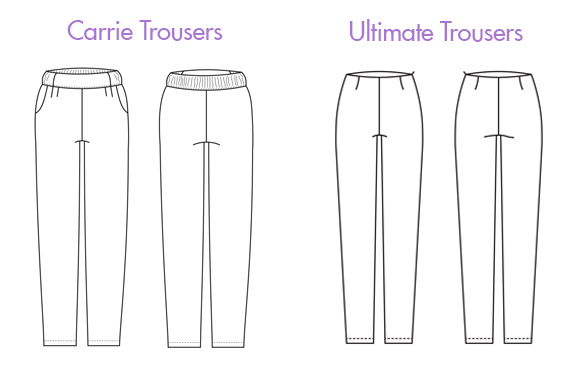 The class focuses on two areas: basic trouser making for beginners (where you make the easy-fit Carrie trousers), then fitting and sewing the Ultimate Trousers for those who already have some trouser making experience. - The waistline is too low for my taste and the trousers feel like they're riding down throughout the day. - There's a weird bagginess around the front crotch which you can see in the blog photos here. I needed to find a way of removing this excess fabric. So I sat down to watch the class to see if I could sort these issues out. The first bit was easy - there's a whole section on making style changes to the pattern, one of which is raising the height of the waistline! 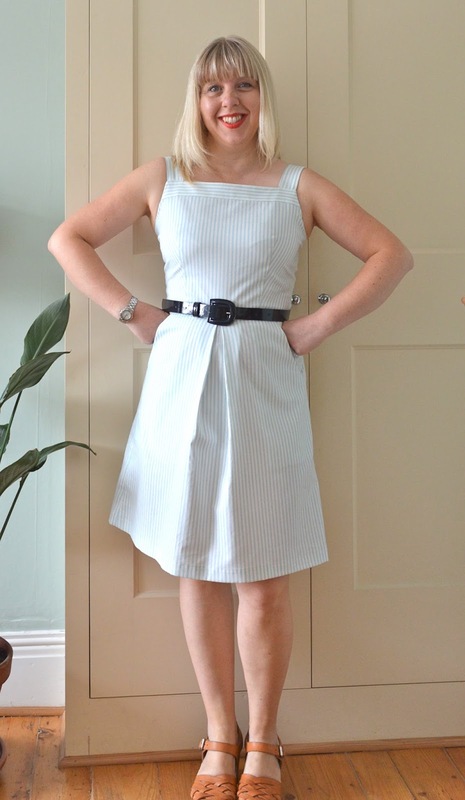 I made the adjustments to my pattern pieces as instructed and raised the waist by two inches. For reference the waistband now sits level with my belly button. 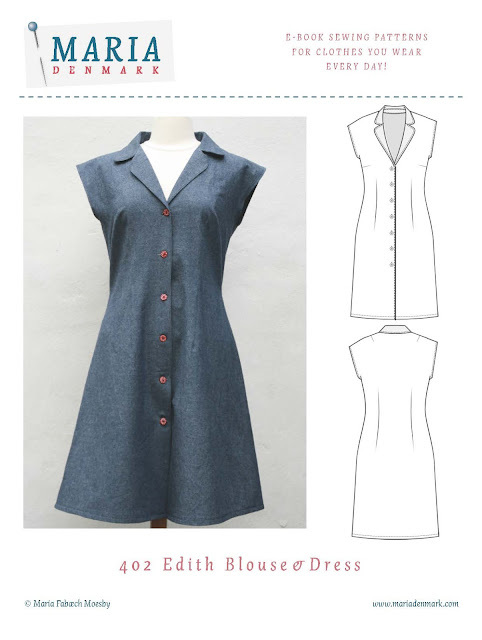 It's worth noting that there's also a lesson on adding a waistband to the pattern, including a downloadable pattern piece - very handy. This just left the baggy crotch to sort out…. The 'Fitting Surgery' section of the course is made up of seven downloadable PDFs. Each part focuses on a different fit issue and includes a line drawing, a photograph on a real body and a description to help you diagnose the problem. I went through each section several times before finally realising what my problem was - thin thighs! What?! I can honestly say that was the last thing I was expecting. The adjustment was quite easy, I measured around the fullest part of my thigh, then the crotch line on the front and back pattern pieces. 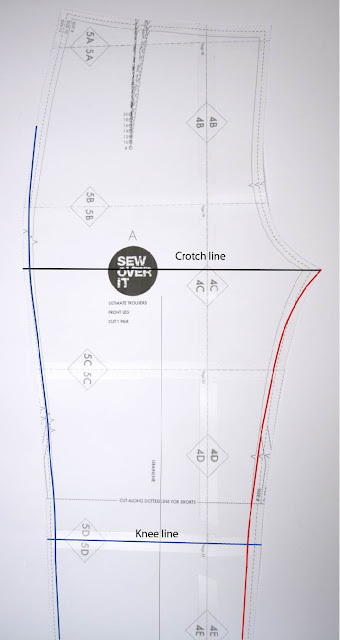 The difference between the two measurements was the amount I needed to remove, spread equally between the inner and outer seams of each leg piece. In my case, this was 1cm from each seam. 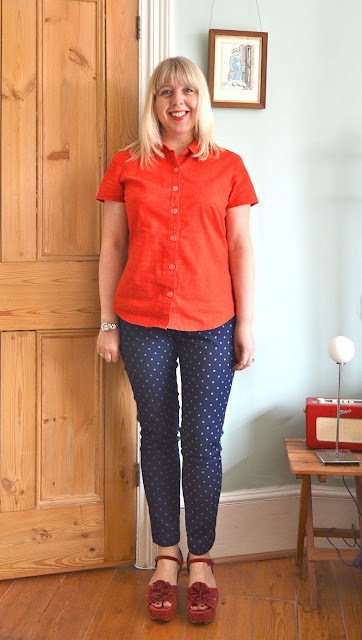 I then sewed up the trousers, tried them on and the fit was exactly what I wanted. Yay! They're very fitted, in fact they look more like jeggings than trousers, but that's what I was after. 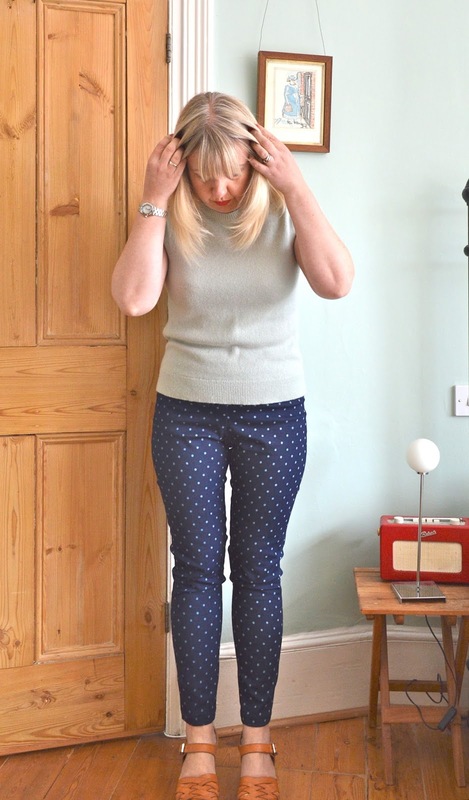 The higher waist is a much better fit on me and stops the trousers riding down. 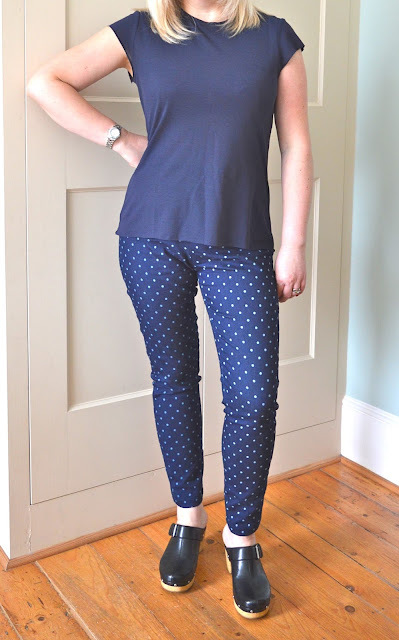 The fabric is a stretch polka dot denim from Classic Textiles on the Goldhawk Road which is sturdier than the previous fabric I used, but still really comfortable to wear. I think I'll wear them a lot. Hmmm, what pattern could I possibly be referring to? Why New Look 6217 of course! 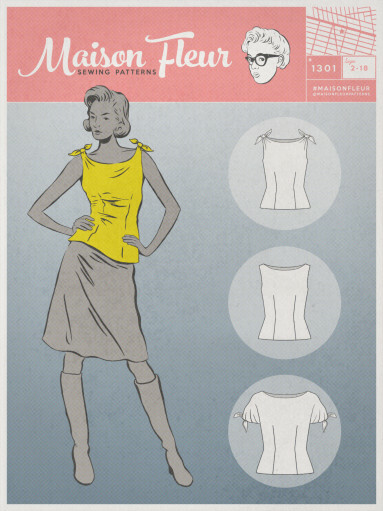 I've made two versions of the top (here and here) and I'm now going to bore you to death about the skirt. 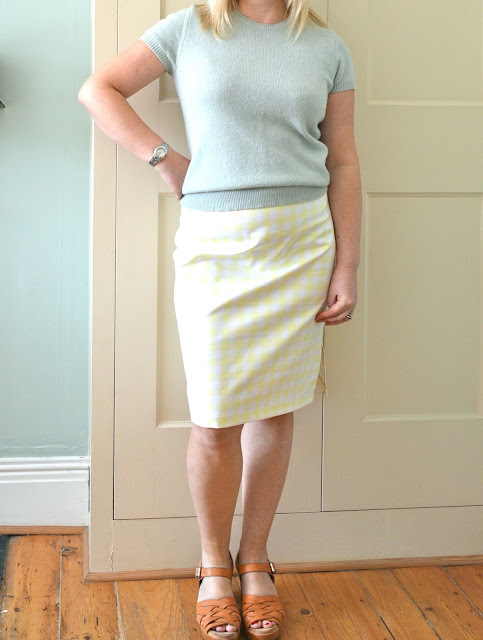 The decision to make the skirt happened slightly by accident… my friend Emma wanted me to help her make a very simple pencil skirt and asked if I knew of a suitable pattern. 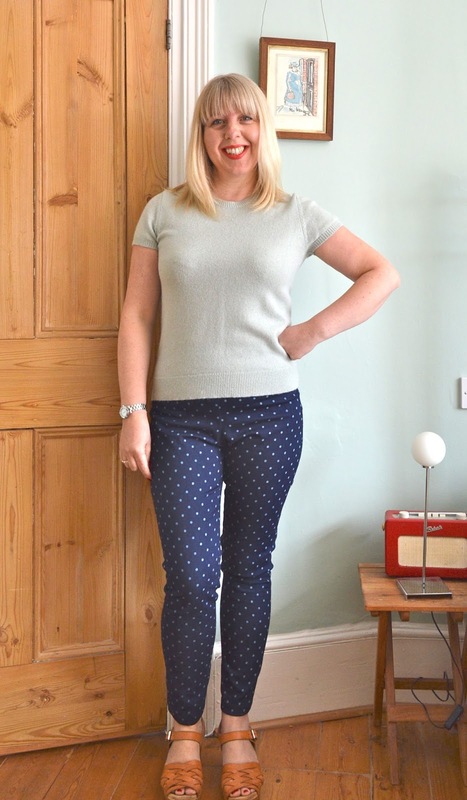 I immediately thought of the New Look pattern - just two pattern pieces, no waistband and an easy side split, perfect for a beginner. I took Emma's measurements and decided to make a quick muslin before we were let loose on her precious fabric. There's quite a bit of ease in this pattern, so I went down one size from her actual measurements and made up a size 12, which also happens to be my size... I tried it on to check it wasn't wildly off and discovered it was a perfect fit on me. This was too good a sign to ignore, hence the decision to make one myself! 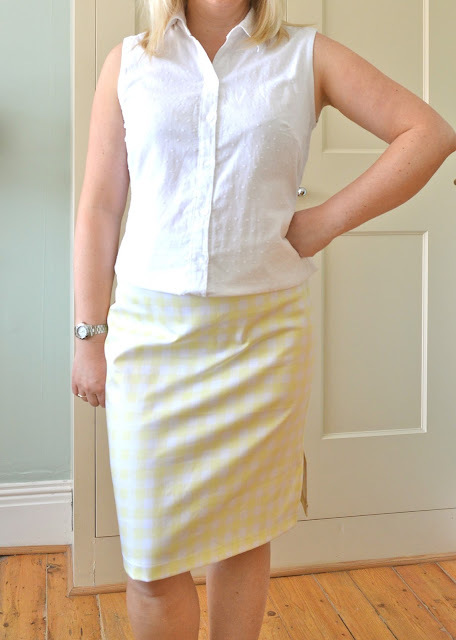 I used a piece of lovely stretch cotton yellow gingham from my stash. I bought the fabric as a vintage remnant so it was only 85cm long, but it's quite wide (150cms), so was easily large enough for a small, knee length skirt. I made no adjustments to the pattern at all, not even to the length, so the skirt you see is a size 12 straight out of the envelope. 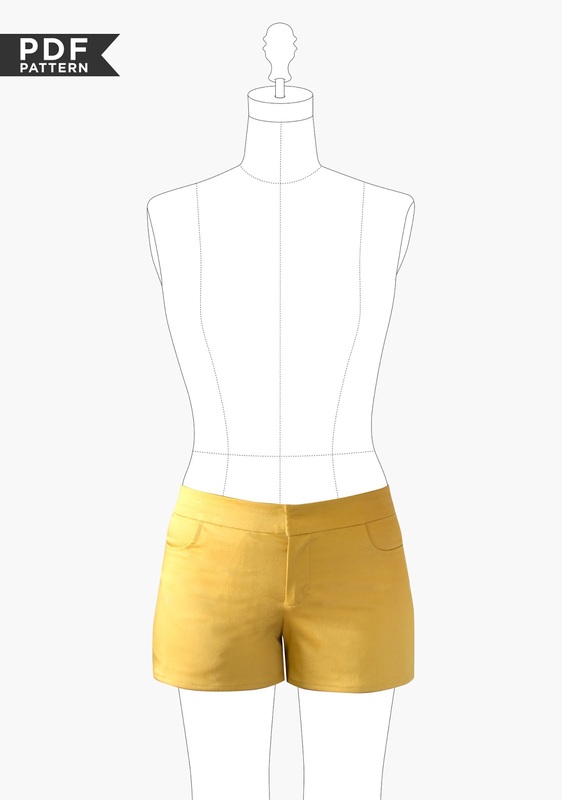 As expected it was quick and easy to make: just two darts to the back, an invisible zip in the side seam and twill tape to finish the waistband. The twill tape is suggested in the pattern for both the skirt and trousers waistbands, and I think it's actually a better option than bias tape. Unlike bias tape, there's no stretch to it, so it should help prevent the waistband stretching out over time. The skirt turned out slightly looser than the muslin due to the stretch content of the cotton, the drag lines on the photos are just from me sticking my leg out! As the skirt is supposed to sit an inch below your natural waist this doesn't affect the fit, in fact it improves it in my opinion! There are no front darts, just back ones, so it's fitted but not skin tight. And the side split lends a air of dignity when getting in and out of the car! With a paper pattern you have a physical reminder of your purchase, but this doesn't happen with PDFs. And because of the additional time needed to print out and tape them together, it's easy to sweep PDFs aside in favour of a quicker fix. Maybe I need to start printing out the instructions and putting them in envelopes so they're more visible? This then got me thinking about what other patterns might be lurking in the shadows in different forms. 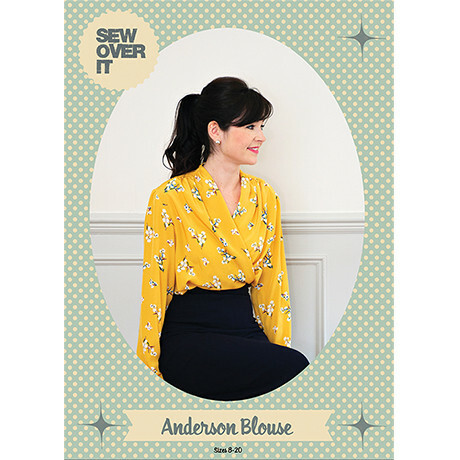 One area I tend to totally overlook is sewing books. Again, it's a mental block with me - if they're not in a pattern envelope I'm blind to them. 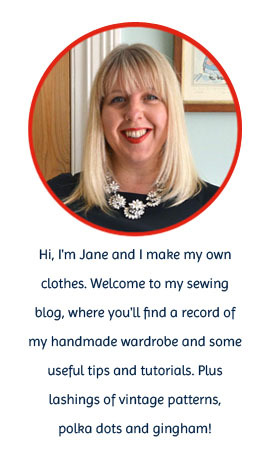 This is mad because I've had some real successes with sewing book patterns (see below), and really should make an effort to use them more frequently. Whilst we're on the subject, I also have an entire cupboard of sewing magazines with free patterns, maybe I should start perusing those too? !